Whether an uncluttered room feels bare or cosy is a matter of personal taste. I’ve always seen empty space as a stunning element and enjoyed it. 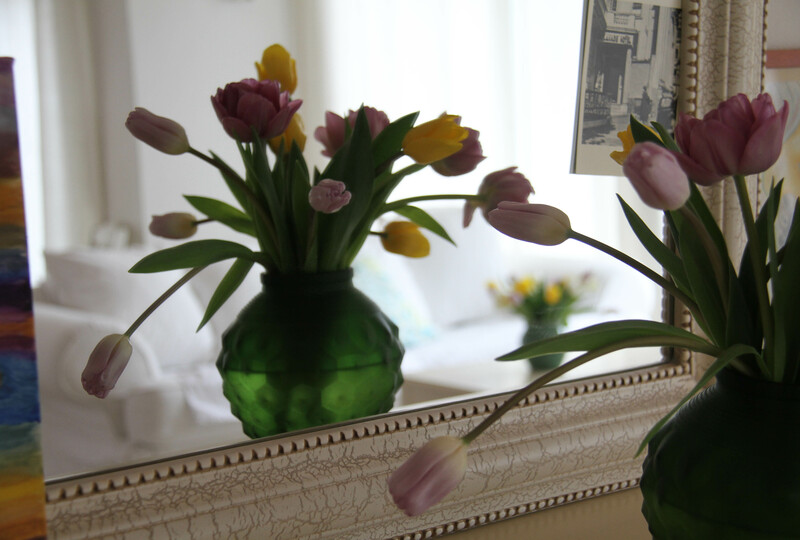 However, sometimes (like in March/April when Helsinki is still gray and there are no signs of spring yet) I feel I’m craving for colors and this year have regularly filled our living room with fresh flowers. Seasonal flowers are an easy, inexpensive way to add color especially if mostly using white and neutral colors. According to decorating magazines decorating means basically buying new stuff and filling the space with clutter. Sometimes maybe first clearing out the old clutter and then bringing in new decorative objects and textiles. I used to do that but I’ve learnt I’m actually happier with less. I have simple white curtains and I just wash them and put them back after cleaning the windows. I have a few extra sheets in my linen closet but most times I do the laundry at the same time with changing sheets and just put back the same sheets after washing them. They are clean and no one can really notice any difference any way. I’ve given away most unnecessary home textiles like a huge pile of cushion covers and some decorative blankets. I have a few floral cushion covers for our living room (the ones you can see almost in every picture) and a few striped ones waiting in my closet in case I want some variety. The easiest way to decorate without adding unnecessary clutter is to pay attention to space itself. Airy, white room is gorgeous but adding a patterned wallpaper can be a good solution as well. A beautiful view means no curtains are needed at all. A fireplace makes every room cosy and is more interesting to watch than a television. Depending on the size of the room a unique piece of furniture or beautifully designed lamp is enough to give a simple, decorative effect. Creating “functional spots” makes an apartment or house feel personal and suitable for people living there. I love my simple kitchen because I enjoy preparing simple meals and spending time in the kitchen thinking or listening to music without distraction. I bake breads or cakes, make salads and cook simple chili or curry meals. I don’t cook complicated, formal dinners or generally need any special equipments. Also, I’m excited about our new library because it will be my “reading spot” and I believe it won’t be too messy with only one group of items, books. Grouping everything at home, keeping the number of groups small and the size of every group easy to control and locating these items where we actually use them (places I call functional spots) make the home cozy and easy to organize. I like bedrooms simple and calm for resting and kitchen and laundry room fresh and pleasant for different household activities. Generally, the best decorating tip is to give a home a good spring clean. I can tolerate some mess, it’s inevitable with kids and dogs, but there’s nothing as energy boosting as a properly cleaned, fresh house. Remove the dust, give every surface a good scrub using natural, organic cleaning products and let in a lot of fresh air. Putting anything on the table – even if it’s only a flower pot or a vase full of flowers – means like giving your family members a permission to leave their stuff there. I love flowers but I need to tell you this as a warning. I put flowers on the table and it’s almost like they are asking for company! My son leaves his book next to the vase, my another son locates his iPad on the table and in the end of the day the table is cluttered with electronics, school books and coasters. If this is too much, a good solution that doesn’t attract clutter is to add color and personal touch putting something (art, photos, prints) on the wall. Cosy.